We faculty who teach with technology claim we can multitask. Yet there is a bigger question: can anyone really do that? And what does "engaged in learning" mean to the Millennials we now teach? I went to the June 2 Second Life Education Roundtable with those questions in my head, after hearing our topic from organizer AJ Brooks. 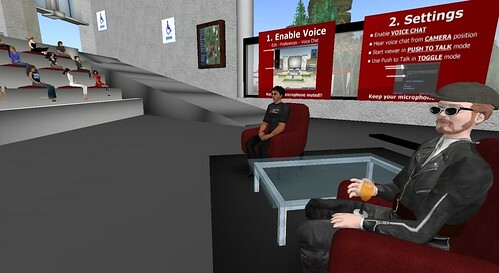 AJ pulled off a coup by bringing Harry Pence, (SL: John2 Kepler) to a voice-chat meeting where Harry discussed his ideas and took questions from the audience. Harry defines engagement as involving "being focused on the matter at hand"
We tended, as a group, to dismiss the idea that our minds can really multitask. Harry noted reading in Howard Rheingold's blog about two types of attention, "multitasking" and "continuous partial attention" (Visit Rheingold's entry on attention, as well as higher-level links to his Video Blog and his Web site). Harry has never had a college student say "that's too much" when he presents using voice and screen, but older audiences often get lost. His college students agree with him when he says that their younger siblings are truly fluent with networked technologies and will replace them in the workforce. AJ Brooks made a salient point I have often found true with my students: they are adept at using but not understanding the technologies. Iggy's examples from his students: how few reallly can solve problems that require alpahnumeric fixes (such as tweaking source-code) or making proper back-ups or hardware hacks that come naturally to old geezers like me who can work on their own cars and build stuff with tools. KZero's diagram of Virtual Worlds by age of users, Q4 2008: http://www.kzero.co.uk/blog/?page_id=2563 shows SL with a smaller, and older, demographic than many of the virtual worlds younger Millennials are using now. The open question remains whether or not they'll take to SL or something like it, with user-generated content, when they get older. We noted how many of the worlds younger users encounter do not permit creation of new content. CathyWyo1 Haystack then asked, "do we want a generation of kids who are passively engaged or actively involved in the creation of their space?" We all grew concerned about a generation "taught to the tests" and not encouraged to do as much collaborative learning. Harry noted a class in high school he encountered, where "Principal put them at the end of the hall b/c they were making too much noise and having fun" and making noise. I'm fond of Rheingold's maxim that "Mindfulness and norms, my students helped me see, are essential tools for those who would master the arts of attention." Can one be mindful of two things at once? Yes. Do them equally well? That I don't know, but that too is where the norms for my class come in. In fall, if a student is online during class and it's not course related, the norms are this: first time = warning, second time = "skipped class" in gradebook. You can read the entire transcript of Harry's talk here.